On several occasions over the years I've mentioned that one of the best current bands going is Rumspringer. I've tried to do my best to keep tabs on them so I don't miss out on any of their records and in doing so I came across the band New Colonies, featuring Wes from Rumspringer. 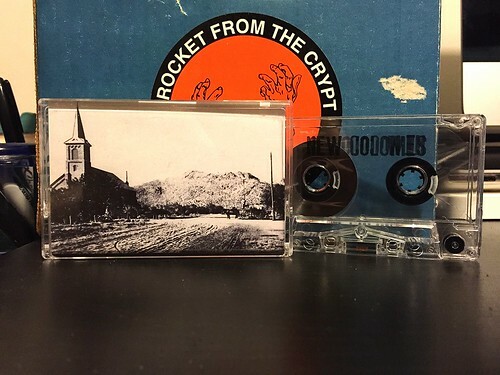 You can insert my usual 'I'm not really big on tapes' comment here, but I will say that when a band puts out a limited run cassette as their first release, that doesn't really bother me much at all. If anything that just seems like how it's suppose to happen. Feels like the 90's to me. Anyway, where I think Rumspringer tends to follow the sounds of west coast, Crimpshrine style punk rock, New Colonies is taking a very different path. I would put the songs on this much closer to a Leatherface, Manifesto Jukebox or I Excuse kind of loud, raspy voiced attack. You can hear a lot of the Frankie Stubbs influenced palm muted riffs and New Colonies manage to weave those riffs into giant choruses and big hooks. I will admit to being a complete sucker for this sort of thing. Leatherface is not only one of my favorite bands in the world, but they've influenced so many of my other favorite bands as well. This is the sort of music that really clicks with me and I cannot wait to hear more from New Colonies.